With atmospheric carbon dioxide (CO2) concentrations increasing in recent years, the result has not only been a warming of the atmosphere; the increase levels of CO2 have also been contributing to an increasing acidification of the world’s oceans. This acidification has consequences for ocean marine life, especially in the Arctic Ocean. The top layer of the ocean mixes with the gasses found in the atmosphere immediately above it, and as this mixing occurs, the gasses from the atmosphere become dissolved in the ocean. So as the amount of CO2 in the atmosphere has been increasing, so has the amount of CO2 dissolved in the oceans. And as CO2 forms carbonic acid (H2CO3) when it gets dissolved in water, an increase in atmospheric CO2 inevitably leads to a decrease in both the alkalinity and pH, and an increase in overall acidity of the world’s oceans. This process, known as ocean acidification, has consequences for marine organisms such as shellfish, which require a less acidic environment with higher pH to be able to develop protective shells. The Arctic Ocean is particularly susceptible to acidification, and the impacts of acidification on Arctic marine ecosystems is more pronounced. Dr. Agneta Fransson from the Norwegian Polar Institute (NPI) in Tromsø, Norway explains why. How serious problem is ocean acidification in the Arctic? It’s becoming a serious problem. Earth’s oceans have taken up more than 30% of human-generated carbon dioxide (CO2) emissions, and this has decreased the pH of the ocean water by 30% on average. As pH decreases, so does the concentration of carbonate ions (CO32-) in the water. Organisms like shellfish that form calcium carbonate (CaCO3) shells and skeletons need significant amounts of carbonate ions in the water in order to form their shells and skeletons. Lower pH can also affect the ability of certian organisms to reproduce. Maintaining the right chemical balance in the oceans is important for the health of the organisms that live there. Maintaining a more alkaline environment (higher pH) is essential for ensuring good internal cell functioning of many organisms. 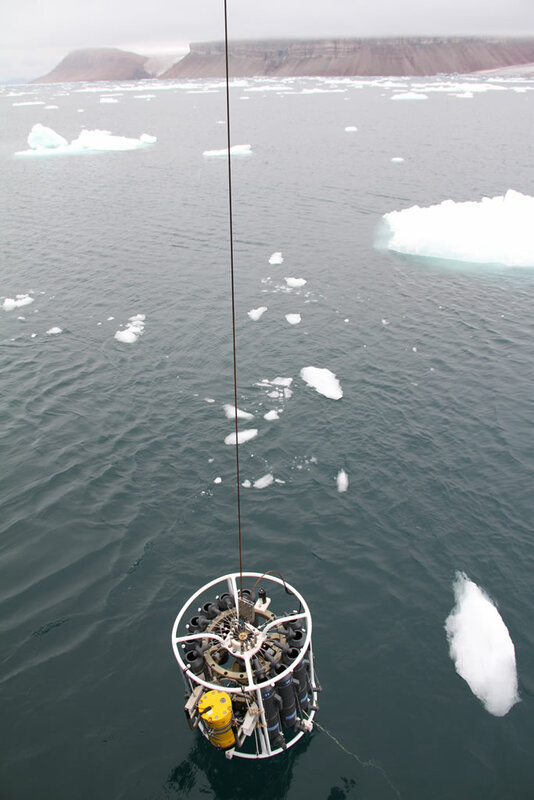 Where have measurements on ocean acidification been taken in the Arctic? We don’t have many long-term time series measurements of pH in the High Arctic, but we do have measurements that indicate that pH has decreased in the Icelandic Sea where scientists have observed in a 20-year study a pH decrease of 0.002 pH units per year due to increased CO2 concentrations in the water, which have increased an average of 2.1 parts per million (ppm) per year. These observations show that changes are happening at a rate twice as fast as predicted by models. Scientists have also observed decreased pH and decreased calcium carbonate concentrations in the surface waters on the continental shelves along the Arctic coasts. This is mainly due to freshwater influx from melting icecaps and rivers emptying into the Arctic Ocean. A decrease in pH in winter has also been observed along the continental shelves, due to certain biogeochemical processes such as decay and respiration of organic matter by bacteria, which produces CO2. As climate change is expected to increase local warming, ice melt, permafrost melt (which will release carbon dioxide and methane), and river water influx, ocean acidification in the Arctic is expected to increase in the coming years. How does freshwater runoff from rivers decrease the pH of the ocean water? Freshwater runoff from rivers flowing into the Arctic contributes to ocean acidification because river water from North America and Eurasia usually contains large amounts of organic matter. This organic matter leads to an increase in CO2 in the water due to remineralization of organic matter by organisms, which produces CO2, and an undersaturation of calcium carbonate (CaCO3) in the water. The type of bedrock in rivers influences the alkalinity of the water that flows out of them into the Arctic Ocean. Are Arctic waters more susceptible to ocean acidification compared to the rest of the world’s oceans? If so, why? The Arctic Ocean has had high concentrations of CO2 dissolved in it since historical times. This is due to physical processes such as cooling of the relatively fresh surface water, which causes this surface water to sink below the surface towards the bottom of the ocean. When this colder, denser water sinks, it sequesters atmospheric CO2 in the Arctic Ocean. So this results in the Arctic Ocean having a much lower pH and concentrations of carbonate ions (CO32-) compared to other oceans of the world. The water in the Arctic is also colder. Since CO2 is much more soluble in cold water than it is in warm water, this makes it easier for the ocean to take up more CO2. In addition, as sea ice cover continues to retreat in the Arctic, there will be more open water, which may allow for more direct CO2 uptake into the ocean, and further lowering the ocean’s pH. And, as I mentioend earlier, freshwater influx from rivers empyting into the Arctic ocean, along with melting sea ice, also contribute to lowering the pH of the ocean. What kind of impacts on ecosystems can one expect in the Arctic? Some organisms will not do so well because of increased ocean acidification. Some species may disappear all together. The ability of shellfish to build their shells will be impacted. In addition, lower pH will have an effect of the metabolism of many organisms as well as their ability to function on a day-to-day basis. 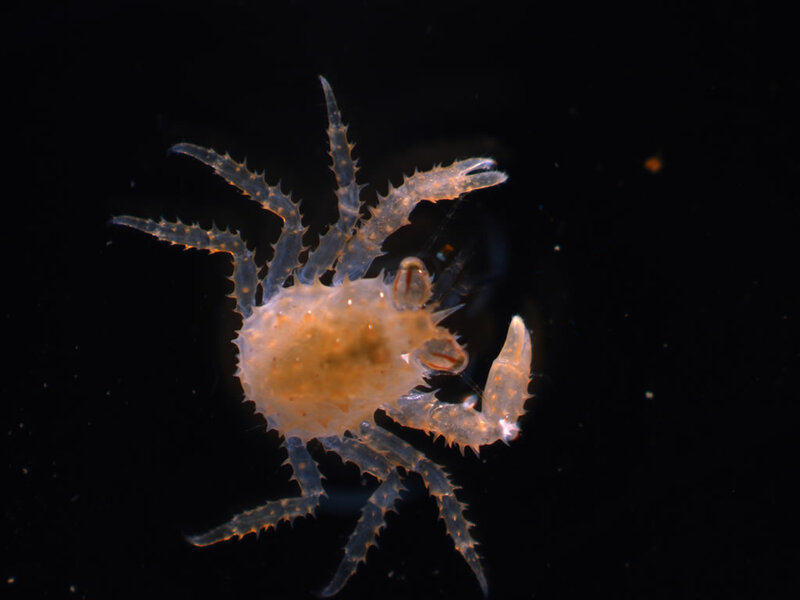 Due to the new stressors they face, some organisms may become smaller and not develop properly, and, as a consequence, have problems reproducing. 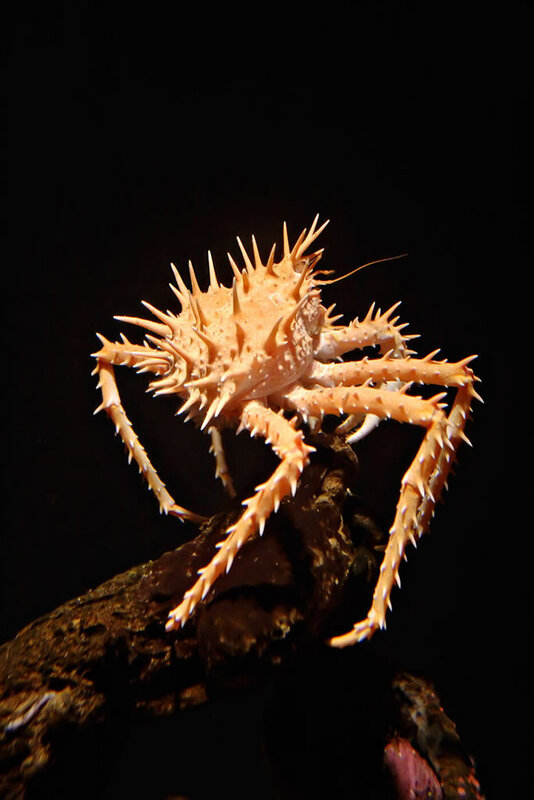 So the populations of these species will drop, and the species that depend on these shellfish and other marine organisms in the ecosystem as a food source will also be impacted. At the same time, some species will do well under the changing environment. Phytoplankton (which are primary producers in the food web in the Arctic Ocean), will be favoured by increased CO2 so the more CO2 available to them, the more they grow. But extremely large phytoplankton growth could have an impact throughout the ecosystem and the food web in the presence of more phytoplankton. The food web in the Arctic Ocean is sensitive. So a significant increase in the population of one species or the disappearance of another could have dramatic ripple effects on the entire Arctic marine ecosystem. The additional effects of increased climate change such as ice melt, more freshwater and warming, in combination with ocean acidification, will put further stress on the organisms and ecosystem. Is there a tipping point beyond which we might see significant, irreversible effects of ocean acidification? At the moment, we don’t really know what the tipping points are for Arctic marine ecosystems. However, from studies on marine organisms, we know the threshold for individual organisms but not for the whole ecosystem. We also know the chemical equilibrium needed for calcium carbonate (CaCO3) shells in the form on the mineral aragonite to remain intact, and not be dissolved, which certain models predict (Steinacher et al 2009) will occur in the surface waters of the Arctic Ocean by the year 2030. In areas with large amounts of river runoff and ice melt, undersaturation of calcium carbonate along the continental shelf in many parts of the Arctic Ocean has already been observed locally (Chierici and Fransson 2009). However I should add that this is the threshold only for calcium carobnate in the mineral from aragonite, and the upper tolerance limits for individual organisms may vary, as certain organisms are able to regulate their bodily pH internally. However even if organims can regulate thier pH, it will require them to expend more energy to do so, putting extra stress on them. Studies by a number of research teams (Agnalt et al 2013, Comeau et al 2009, Comeau et al 2010, Hurst et al 2013, Long et al 2013, Waldbusser et al 2013) have shown that marine organisms in the early stages of their life cycle are particularly susceptible to the effects of ocean acidification. But we aren’t yet able to say exactly where lies the tipping point beyond which changes will be irreversible. Scientists are currently conducting studies that will help them predict when and how this might happen. Over what kind of timescales would it take for the entire groups or organisms and ecosystems to be affected? We can’t answer that question at the moment. Different organisms react differently to changes in pH. We can only predict using models when undersaturation of calcium carbonate (CaCO3) will occur, and that this undersaturation will likely happen sooner than predicted. However, these models don't take into account the response and adaptation of the marine organisms. So far, scientists have only been able to conduct short-term experiments, so we’ve only been able to see what the effects are over one or two generations, and then from this logically predict what might happen over the long-term. For predicting exactly, when we might see changes in groups of organisms and entire ecosystems, we need to have more long-term research data. We haven’t been looking at this problem long enough to be able to say, for instance, if there will be any changes in how species might evolve from generation to generation in response to a decreasing pH in the oceans, and exactly how this might take place. What we can say is that some organisms will be able to adapt quickly to the changes or move to more favourable locations, and others won’t be able to adapt so quickly and hence will suffer or die as a consequence. Some organisms will find the new situation more favourable to them, while others will find it less favourable, and these changes will ripple throughout Arctic marine ecosystems. What do you suggest is needed in terms of further research? We really need long-term observations to be able to identify trends in how marine organisms are reacting to the changing chemistry of the oceans they live in. We need to follow the changes taking place so we can also clearly identify the long-term consequences of ocean acidification. Long-term research to see how individual species adapt and evolve to the changes in ocean chemistry is also needed. And it’s essential to do long-term experiments on entire ecosystems. There hasn’t been enough ecosystem-wide ecosystem research conducted in the Arctic Ocean. A number of years ago there was an attempt to engineer a solution to reduce atmospheric CO2 by providing nutrients to phytoplankton to help them grow. As they take in CO2 as they grow, phytoplankton have the potential to reduce atmospheric CO2. However an increase in phytoplankton growth will, as you say, have ripple effects on the marine ecosystem. Do you see these kind of engineered solutions as feasible? If not, what kind of solutions are feasible? I think that these “fertilization” experiments where phytoplankton draw down CO2 after receiving iron or other nutrients are short-term solutions, and not the way to go. Studies in the Southern Ocean and in the North Pacific Ocean have shown that the CO2 incorporated into the bodies of phytoplankton in spring and summer likely will return to the surface through processes such as remineralization of organic matter, which produces CO2 and physical mixing in fall and winter, where CO2-rich water from deeper water layers is brought up to the surface, often due to strong wind. In the worst case scenario, this upwardly transported CO2 will be outgassed back into the atmosphere to some extent. More phytoplankton could be a food source for zooplankton and fish, but it depends on which species of phytoplankton will be dominant. Some are more attractive as food sources. Too much phytoplankton in certain parts of the world’s oceans, for instance in the Bering Sea, have occasionally have completely covered the surface and obscured it to the point that birds were no longer able to catch fish. This can cause a shift in the whole land-ocean ecosystem. The best solution is to limit the emissions of greenhouse gases such as carbon dioxide (CO2) and methane (CH4) and limit pollution from hydrocarbon extraction and shipping in the Arctic, which often produce acidic sulphur compounds, adding acidity to the ocean. The way to go is to find renewable energy sources. Dr. Agneta Fransson is a chemical oceanographer with a PhD in marine chemistry. She is currently a chemical oceanographer and research scientist at the Norwegian Polar Institute in Tromsø, Norway. 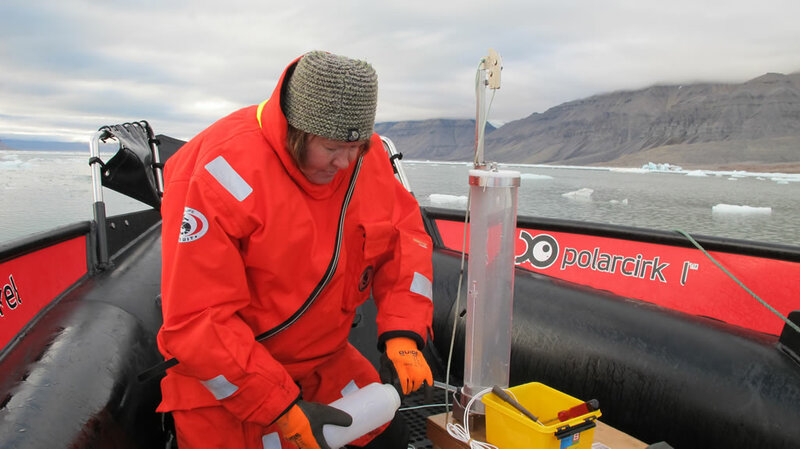 Her research focuses on climate change, ocean acidification and the role of sea ice processes as they relate to carbon cycling in the Arctic Ocean. 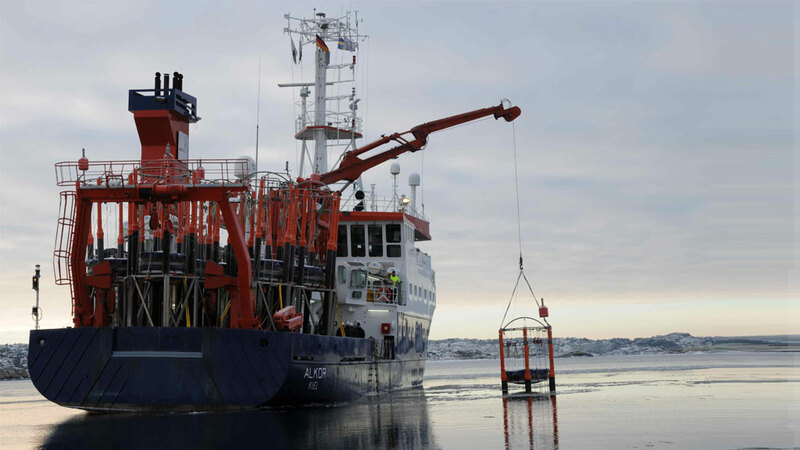 She leads two ocean acidification projects in the Fram Centre ocean acidification flagship in Norway, working in large international collaborations. 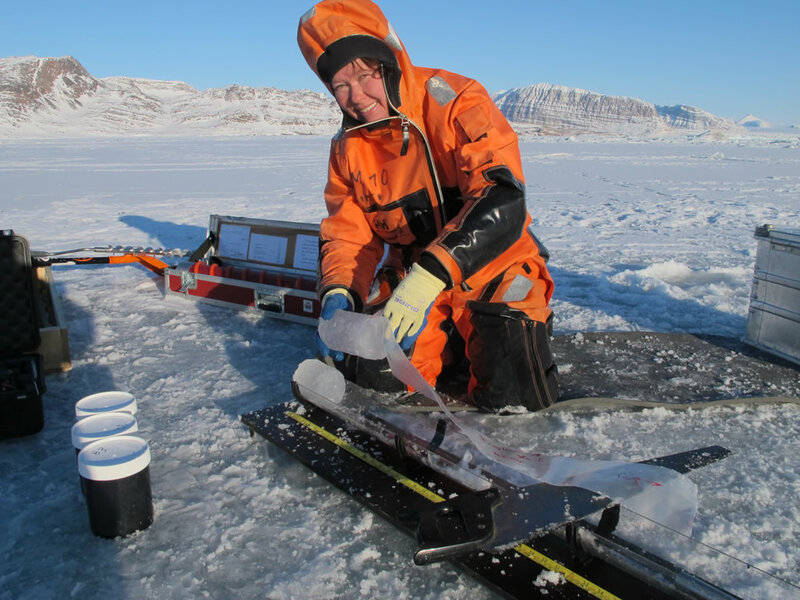 Agneta Fransson from the Norwegian Polar Institute taking samples while on expedition. Agneta Fransson taking samples in the field.